Amelia Peabody lives in a small town where nothing changes. And that's just fine by her. After losing her big sister, Clara, a few years ago, Amelia can't handle any more change. But when she starts eighth grade, she accidentally receives a letter that Clara had written to herself. In it, there's a list of things she'd wanted to do before the end of middle school and never finished, like get on the softball team and throw an awesome birthday party on the lake. Amelia wonders if it's a sign from Clara. Maybe if she completed the list, her heart would stop hurting so much, and she could go back to being her old self. But as she makes her way through, Amelia finds that there's no going back, only forward. And she realizes she'll have to put her own spin on Clara's list to grow and change in the ways she needs to. 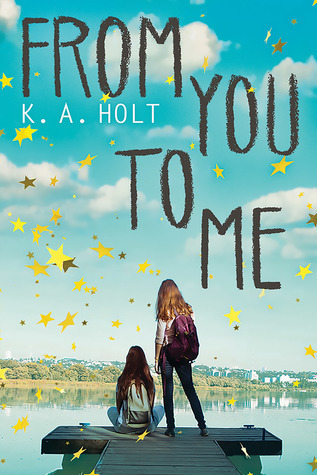 K. A. Holt's beautiful new novel is about grieving and growing up, and the ripples loss creates for a girl, a family, and a community. I'm not exactly sure how it happened, but I read a lot of books about death and grief this summer. Whereas both Planet Grief and Speechless tackle the aftermath of death through a setting which forces the characters to deal with their feelings (a group counselling session and a wake, respectively), From You To Me shows Amelia's struggles to cope with her overwhelming grief long after the dust has settled and the rest of the world has moved on. It's a sad angle, and I thought Holt's representation of Amelia's grief was well done (though I'm lucky enough not to have first-hand experience in this field). However, at times I got really frustrated with Amelia. Her best friend really is a wonderful friend, putting up with way more crap than I would probably have been able to handle in her shoes. Amelia's parents are less great, but that's to be expected since they're coping with their own grief. I did kind of hate how hard her father was pushing to get his wife and daughter to come back to the lake with him (in their shoes, I don't think I'd ever go near large bodies of water ever again!). I liked the book, but somehow it didn't hit me quite as well as the other two grief books I've read this summer. I don't know why exactly that is, but I suspect part of it is because I got pretty frustrated with Amelia at times, and perhaps partly because as a Christian I was a little uncomfortable about Amelia's thoughts on the afterlife. On the whole, though, it's a pretty good book. If you're on a kick looking for stories about girls coping with the death of their older sister, I recommend Riding the Flume by Patricia Curtis Pfitch. That's been one of my favorite books for over a decade!